India’s Model BIT includes detailed provisions that aim to regulate access to Investor State Dispute Settlement (‘ISDS’) mechanism. Several law and policy matters have been excluded from ISDS scope, pursuit of local remedies by investors has been made mandatory, and, procedural and temporal pre-conditions have been prescribed in order to file arbitration claim. 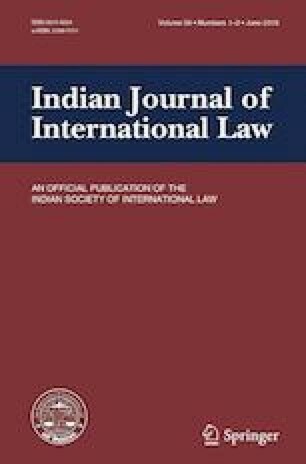 This paper evaluates whether the ISDS mechanism in India’s Model BIT strikes an appropriate balance between investor rights and a sovereigns’ public policy prerogatives. In order to determine the same, the paper analyzes ambit of ISDS scope exclusions; scope for review of States’ action on excluded matters and possibility of claiming reparations under the BIT for losses consequent thereto; and, feasibility of pursuing local remedies. This paper concludes that India’s Model BIT tilts the scale in favour of the State vis-a-vis investors because by restricting access to ISDS mechanism, investor rights would effectively be weakened. Sanyukta Chowdhury is an alumna of National Law School of India University, Bangalore, India (‘NLSIU’). She completed her B.A., LL.B. (Hons.) from NLSIU in 2005 and was later conferred LL.M. degree by National University of Singapore, Singapore. In recognition of her academic and professional achievements, Sanyukta was awarded a scholarship by Faculty of Law, National University of Singapore. Prior to joining NLSIU as Assistant Professor, Sanyukta worked for over a decade in the India tax practice of multi-national accounting firms such as Deloitte, KPMG and Ernst & Young. As a tax practitioner, Sanyukta advised her clients on complex issues of application and interpretation of indirect tax laws as well as tax structuring. She also represented her clients before tax authorities in relation to dispute resolution. This paper is based on findings of the author documented in a research paper on this topic that was submitted as part of coursework for the LL.M. program at National University of Singapore.